To mark the relaunch of TABlog, we interviewed architect Kisho Kurokawa about some of the latest events in his career. Already world famous as one of the leading members of the 1960s and 70s Metabolist movement, Kurokawa has been the focus of particular attention over the past few months. 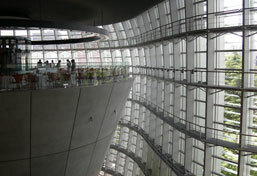 In January, after two decades of planning and construction, his National Art Center finally opened to the public, with an inaugural retrospective exhibition of his work; in March, he ran for Governor of Tokyo, and since April, his iconic Nakagin Capsule Building has come under the threat of demolition. Did organizing your retrospective at the National Art Center affect your perception of your own career in any way? That exhibition was the biggest that I have ever held in my life, occupying a 2000 square metre space. No matter where you are in the world, you don’t really find exhibitions on that scale. Previously, I held an exhibition at London’s Royal Institute of British Architects, which was in a 1000 square metre space. After that showed in a 290 square metre space at the Art Institute of Chicago. The Japan Centre in Paris is 450 square metres. Compare that with 2000 square metres – it’s really is a big space, isn’t it. Architecture is inherently a large-scale media, so architectural photographs should be as large as possible in order for viewers to get a sense of what they are looking at. I have had many exhibitions that have traveled around the world, but this one was by far the best of the lot. I was also really pleased that I could design it to be accessible for ordinary people and not just architects. How has the building changed in the time since it was proposed in the 1980s and its realisation now? Everything – the details, the materials, the proportions and the function of the building – were realized without alteration. Even I was surprised by that. The original proposal had no details described in it, so I had assumed that while discussing the building’s actual realization with clients, there would probably be both minor and major changes made to the design. However, there were five committees involved, administrative committees and so on. There was also a committee in charge of deciding what kind of cafes would go inside the museum, and of course one that decided how flexible the exhibition spaces should be. With several different committees like that, of course not everyone is going to share the same opinion, and there were a lot of differences of opinion. I’ve spent ten years on this project; in fact it’s been twenty years since I entered the competition to design the museum. I have been working on Metabolist architecture and fractals all this time and of course, there is the inevitable timelag you get while the building is actually being built, so I saw this project as an extreme test of myself. It was scary to wonder whether my ideas from twenty years ago would still seem fresh to the architects and people of today. But I was confident that it would turn out well. Have construction methods changed much in those 20 years? For this particular building, the construction methods really weren’t very difficult. I calculated it all myself so that there would be four exhibition spaces without columns, on top of which would be a 3.5 metre thick Super Slab. Then, at the front of the building I wanted a coffee shop and a restaurant. I wanted a coffee shop on the second floor and a restaurant on the third floor. I made the ground floor as open an area as possible, so as to allow for the free flow of people, and I managed to make everything work out in accordance with those conditions of mine. I also used quite a lot of unfaced concrete in the structure of the building; precast concrete is easier to have made off site, where you can manage the quality control. Pouring concrete on site requires shaping, moulds and so on – you see a lot of this in Tadao Ando’s work. I’m impressed by how beautiful his use of concrete is, but it is difficult to produce. The outside wall at the back of the building and the interior cones are also made from precast concrete, giving the building a strong sense of density while also being easy to produce off site. So for the construction companies, of course, it was a challenge compared to standard buildings, but they made it work out. There was also the issue of putting down wooden flooring; national bodies don’t usually give permission to use it as they think that the flexibility of wood would make it hard to preserve its flatness. However, I suggested using ironwood, which is a heavy, hard wood that sinks in water, and therefore doesn’t move or warp, even if the temperature changes. You can use it on a terrace, and even though it gets rained on, it won’t degrade for 200 years. 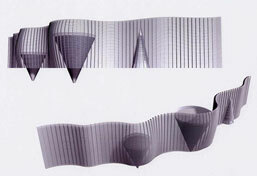 So, having chosen those kinds of materials, there was no particular stress when it came to constructing the building. However, there were some problems with building the façade, and my ability to resolve those problems were all thanks to Mandelbrot’s fractal geometry. I found one of his formulas that allows you to take any point on a curved surface and plot it on a three-dimensional coordinate axis. That’s fractal geometry. If you enter that in to a computer, it makes the positioning a lot easier once you’re doing the construction on site. What at a glance looks complicated is just geometry. By approaching it that way, despite the Ministry of Education and Culture’s budget being as low as it could possibly be – lower than any other ministry – the building turned out very well. That’s down to my experience and creativity, something I allow myself to take a little pride in. Could you tell me a bit about your decision to run for governor of Tokyo this year? I had no interest in politicians until now. However, as an issue of fate, planning a new capital city for Kazakhstan, the act of moving the capital is an inherently political issue. Whole governments, nation can be divided into pro-president forces, anti-presidential forces, which is extremely political. It’s difficult. It’s the same in Malaysia; they were transferring their capital and I designed an airport for Kuala Lumpur. But Malaysia had a movement against its Prime Minister Mahathir bin Mohamad and the more I communicated with him, the more I was attacked by his opponents. When Tanzania moved its capital city, there was the issue of whether money for it would come from Japan, from China, or from its neighbour Zambia. China sent in their soldiers and built the TanZam railroad for free. So when you look at my designs for that capital city, you could say China took over the whole thing. The Japanese government couldn’t fund it, so my city planning became a little strange from half-way through as Chinese ideas about city planning had to be integrated. In that way, the work I’ve been doing for the last fifty years has already had a political dimension to it. So when I am in Tokyo, it is impossible for me to avoid political issues. I have already written many books about how I think Tokyo should develop and what I think the problems affecting Japan are; I have been a newscaster for NHK for 18 years and have written 140 books. I took the stance of a critic but realized that a critic can’t change anything. I am now 73 years old, so it is time for me to sacrifice myself – I feel I should sacrifice myself for Tokyo and Japan. In that sense I am a volunteer. That’s what made me start, and now in his third term, Governor Ishihara is powerful. The previous election campaign was difficult, but yesterday I announced that I would be running for election to the House of Councillors. I will be starting my campaign in Tokyo as of tomorrow. Other than me, the people who are running are all part of organizational parties, and are therefore professionals, vote-gathering machines. I established the Kyosei Shinto Party, but it is a non-political party. This time I think I’m going to win. Can you suggest three key aspects of Tokyo’s architectural situation that could be improved on? People don’t really know what Tokyo is. Tokyo bay reaches deep into the city, bringing the sea up to the edge of Ginza. That area of the city hasn’t really been structured as part of the whole. There are canals and there’s the sea, and I have sailed up and down them on my cruiser, and I have seen how the city along those waterways retain the traditions of the Edo period; I think it is unacceptable to develop a place like Tsukiji in the same way as the rest of the city. Rather, the canals need to be preserved, the height of buildings around those areas needs to be kept low, so as to preserve the traditional Japanese lifestyle, and to give something for tourists to enjoy too. I think Roppongi is an important, new cultural centre. 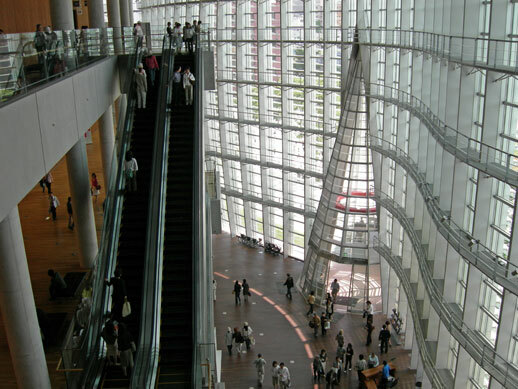 The National Art Center has been established there, there is the Mori Arts Center / Roppongi Hills, with a 24 hour library in it, and with the completion of the Suntory Museum, this area has become a cultural centre. Until now, culture has been concentrated in Ueno, with Kunio Maekawa’s Concert Hall, LeCorbusier’s Museum of Modern Art, and art universities such as the Tokyo National University of Fine Arts and Music, and with the zoo, people refer to that area as the ‘cultural forest’ (Ueno no Mori) of Tokyo. Roppongi will be different from that: it will form a city centre that lives the high life in a more international sense than Ueno. Roppongi will foster a higher level of creative Japan – a new ‘cool Japan’ could emerge out of Roppongi and the nearby areas of Akasaka, Ginza, and Aoyama. The third area would be to the west, into Tama New Town, Tachikawa, Chofu and Nerima; the city spreads out west and that’s where the majority of people live. However, back in the Edo Period, there were just mountains in those areas. The population grew at the time when there was Edo Castle, and the Edo Bakufu Government built a new town on the other side of the Sumida River. So as I said before, in traditional areas like Asakusa, around Senso-ji Temple and the Kaminari Gate, there are a lot of craftsmen still living and working. So that area is essential to Tokyo. Another area that I think mustn’t change is Shibuya. Until recently, Shibuya had the Tokyu Planetarium and cinema, whereas now it is Shibuya 109, Parco, Seibu; like Silicon Valley the whole area has become filled with venture businesses. Then, as the population has continued to spread to the west, young people don’t hang out in Ginza anymore, but in Shibuya. Shibuya is a particular gateway for people living in West Tokyo. Tokyu Ltd and Japan Rail East are due to start redevelopment work on the area soon. So Shibuya will feel like yet another, slightly high-tech, business centre. That’s probably what it will change into: shopping and business living together. You have said that you think that if Tokyo is chosen for the Olympics in 2016, it will have a bad effect on the city. Why? Yes, I think it will. I think it would have a bad effect on Tokyo, but that it would also have a bad influence on the rest of the world. I am an advisor for both the Beijing Olympics and the London Olympics; it has already been decided that the Olympics will go to London after Beijing. So when people wonder where the next Olympics will be held after that, they know that it won’t be in Europe or Asia, that it will more likely be somewhere like Dubai or Chicago. If the Olympics moves around the world like that, it will have a positive effect; that’s how everybody views it, so I think it is a waste of time for us to go out of our way trying to make it come to Tokyo. We won’t get enough votes for it. Part of the controversy that accompanies the Olympics whichever city it goes to, is that certain areas of the chosen city have to be extensively redeveloped or ‘regenerated’ in order to accommodate it. Regardless of whether the Olympics comes to Tokyo or not, Japan has this ongoing scrap-and-build approach to architecture. How do you feel about the fact that your Nakagin Capsule Building has been scheduled for demolition? 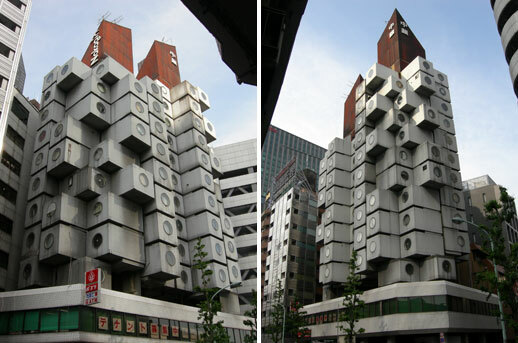 The Nakagin Capsule Tower was born out of the Metabolist movement; I completed it when I was very young, 35 years ago in 1972. I stated my theory very clearly at the time, that if you replace the capsules every 25 years, the building could be recycled for up to 200 years. 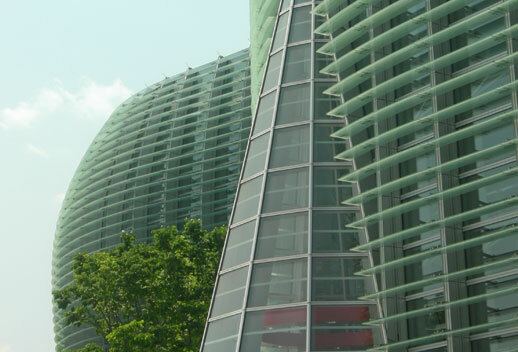 I designed the building to be an example of sustainable architecture, and it was the first of its kind in the world, which is the reason why there are a lot of people campaigning for its preservation. Japanese architectural academics, the Japan Institute of Architects, the Japan Federation of Architects & Building Engineers Associations, Docomomo International, architectural news publications in Japan and abroad, internet news sources in London are all calling for the building to be preserved, and there are petitions that have been signed by tens of thousands of people. The replacement of the capsules would take three and a half to four months for each of the building’s two towers, making the building livable for another 100 years. That’s how I think it should work, but unfortunately, with 140 people living in the building, the ownership of the building is divided up among them. Most of them have inherited those capsules from the previous generation, meaning that while their parents may have loved owning the capsules, they have merely inherited them and are not so interested in them. So there are no particular calls for the building’s preservation coming from its current residents. Another aspect is that the Nakagin company has gone bankrupt and has been bought up by an American hedge fund, so the whole Nakagin building is now owned by that hedge fund. That hedge fund is motivated by money and has no shame about demolishing the building and constructing something bigger in its place to reap higher financial returns. 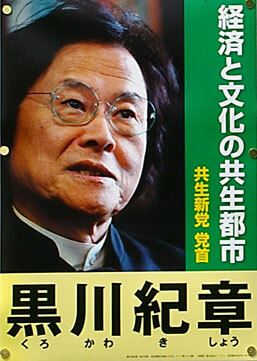 So this whole issue has become not about architectural debate, but about Kisho Kurokawa fighting against the hedge fund. I continue to hold meetings with them. The Japanese front is Toranomon Finance, but there are two hedge funds behind it, motivated only by making money. That suits me just fine: the hedge fund has bought up the property, so I’ll just buy it back from them for a higher price. If they can make more money that way, then they should be happy. They can go back to America and say that the building made money and they gave it back to Kurokawa. Once I become the owner again I can change all the capsules. Hopefully this will all be sorted out soon. Once you’ve completed a building, do you feel that it’s still your possession or do you accept the fate of what will happen to it thereafter? Well, in this case I designed the building to have its capsules replaced every 25 years, so it’s ridiculous that 25 years have gone by and nothing has been done. That was a really stupid mistake. For example, satellites have to be replaced. If you don’t maintain the building and replace its parts, you can’t go on to sell it to somebody else, but this hedge fund comes along and invests in the building, telling people that “it’ll be fine, it’ll be fine, we can sell it on without changing any of the parts”, but that could lead to an horrific accident. It’s the same with cars: Honda makes excellent cars, as do Toyota, Porsche and Benz, but all their cars need proper maintenance and the replacement of parts. If you don’t do that, you’ll have an accident. This applies to cars and to everything else: everything is designed to be maintained. Everybody knows this, and yet you have the ownership of all these capsules divided between 140 people, which makes things really inconvenient. Have your views about deconstruction and reconstruction changed in your lifetime? What I believed in then and still believe in now is finding the least expensive method for replacing the capsules. The central cores are made of steel reinforced concrete, so even demolishing the building will cost a great deal of money. Those cores reach 25 metres down underground, so to demolish all that will be incredibly expensive for any one person. By my estimates it would cost 27 million yen to demolish and create another building of the same size. But if they follow my proposals and replace the capsules, it will cost them only 7.8 million yen, and each capsule could then be sold for 20 million yen. I once sold a capsule for that amount. Are there any other buildings in Tokyo, either by famous or unknown architects, that you think should be preserved? When I built the National Art Center, I preserved the army campus where the February 26th Incident took place. It was the place where 200 young soldiers tried to start a revolution by entering the emperor’s compound, shooting an army general to death. When the emperor told them to stop, they all committed suicide by hara-kiri. Those soldiers were very brave: they made their demonstration because they were anti General Tojo, they were anti-war, and yet despite the death of those 200 young soldiers the government continued with the war. Those soldiers acted in the name of peace, so even though it cost money to do so, I left that site there as it was, at the entrance to the museum. So, whenever possible, I leave things as they are. How do you feel about the planned redevelopment of Shimokitazawa? I define Tokyo as being composed of 300 little towns. Shimokitazawa was where I lived when I was a University Student. It has a really great sense of community, with shopping streets. It’s completely different from Ginza, different from Ikebukuro, Shibuya and Den-en Chofu. So I think the people in Shimokitazawa should be able to choose for themselves what kind of town they would like to live in. A friend of mine set up the Honda Theater there; the area is cultivating young actors and actresses. He was an actor from Toei Film Company. When I was a graduate student at Tokyo University, I would spend time in Shimokitazawa because there were really cheap bars there. Honda was the owner of one of them. There was cheap, domestically produced whisky. This shot bar was so cheap, so I would often go and drink there during my student days. Over many years, he discussed things with people in the shopping street and built one, then two, then three theatres, which he ran himself. As a member of the volunteer Japan Cultural Design Committee, I awarded him the Cultural Design Award. It had been a long time, so I was really happy to see him again. Dr Kurokawa, thank you very much for your time. 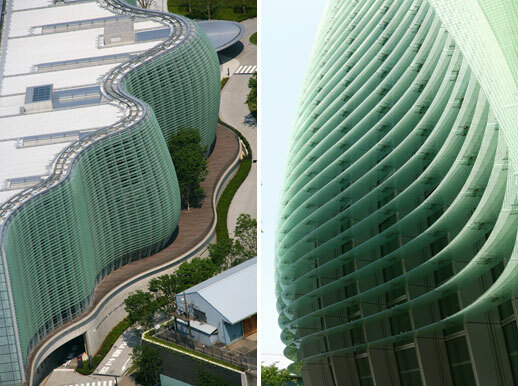 To watch a video of Kisho Kurokawa talking about the National Art Center, click here. 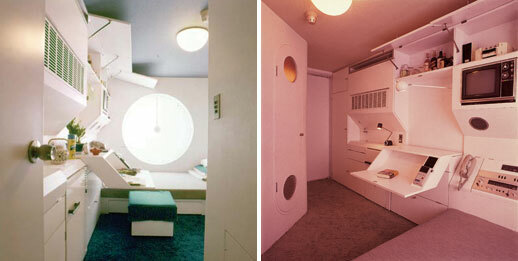 To watch a video of Kisho Kurokawa talking about the Nakagin Capsule Building, click here.